On December 1, 2017, we had a question-and-answer call with Sean Young, PhD, behavioral psychologist, Associate Professor of Family Medicine, UCLA School of Medicine, Executive Director, University of California Institute for Prediction Technology (UCIPT), and founder, UCLA Center for Digital Behavior. A specialist in behavior change, his latest work is the #1 Wall Street Journal bestseller, Stick With It—A Scientifically Proven Process for Changing Your Life—for Good. You’ll also receive a complimentary subscription to The eMentorCoach News, our monthly enewsletter, and can opt out at any time. Your privacy and email address are safe with us. Sean Young, Ph.D., is the Executive Director of the University of California Institute for Prediction Technology and the UCLA Center for Digital Behavior, and is a Medical School Professor with the UCLA Department of Family Medicine. He received his Ph.D. in Psychology and Master’s degree in Health Services Research from Stanford University, worked in technology and user behavior/human factors at NASA Ames Research Center and Cisco Systems, has taught at the Stanford University Graduate School of Business, and has advised various companies and start-ups. He is an internationally-recognized speaker, having presented at forums such as the European Parliament, mHealth Conference, World Congress, and many corporations and academic institutions. Sean studies digital behavior and prediction technology, or how and why people use social media, mobile apps, and wearable devices. He helps people and businesses apply this knowledge to predict what people will do in the future (in areas like health, medicine, politics, and business) and to change what they will do in the future. 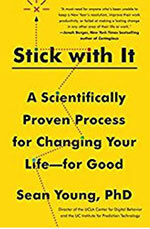 In the #1 Wall Street Journal bestseller, Stick with It—A Scientifically Proven Process for Changing Your Life—for Good, Sean Young, an award-winning psychologist and director of the UCLA Center for Digital Behavior, shows us how to make real, lasting change in our lives and in the lives of our clients. Whether it’s absentminded mistakes at work, a weakness for junk food, a smartphone addiction, or a lack of exercise, most of us—and our clients—have a bad habit or behavior that we’d like to change. But wanting to change and actually doing it—sticking with it to make the change permanent—are two very different things. Sean, a widely respected expert in the field of behavioral science and the director of the UCLA Center for Digital Behavior and the UC Institute for Prediction Technology, knows a great deal about our behavior and how we can change it for the better. Stick with It is his fascinating look at the science of lasting behavior change, filled with crucial knowledge and practical advice to help us successfully alter our actions and improve our lives. As Sean explains, much of what we’ve been taught about behavior change is wrong. You don’t change behavior by changing the person or their personality—you do it by changing the process. Stepladders: how the power of incremental steps creates long-term change. Community: how social support and competition fuel change and keep us accountable. Neurohacks: how a set of mental shortcuts can reset the brain so that people can change old unwanted behaviors. Engraining Good Habits: how success in life and work depends on developing the right behavioral routines. Packed with pragmatic approaches and stories of real people who have used them successfully, Stick with It shows that it is possible to control spending, stick to a healthy diet, become more social, exercise regularly, stop compulsively checking email, and overcome problem behaviors—for good. UC Institute for Prediction Technology Sean is Founder and Director. Accelerates innovations that leverage social technologies to predict human behaviors and outcomes. UCLA Center for Digital Behavior Sean is Founder, includes his research. Formed to advance research on the use of digital and mobile technologies to understand, predict, and change human behavior. Black Box PhD Blog Online fireside chats with collaborators and friends on how to apply psychology in life.